Finally, the Absolute, All-time, Ultimate Cable? Back in 1993, following a long line of innovative achievements, A.J. Van den Hul did something radically new in creating the first non-metallic audio interconnects. Until that time, every audio cable had used conventional metallic conductive materials - copper, silver, gold, silver- or gold-plated copper, aluminum, steel, and copper-plated aluminum or steel - for its conductors and connectors, and non-metallic conductive materials, notably carbon, carbon fibers, or carbon granules were reserved almost exclusively for the manufacture of resistors and automotive ignition cables, where carbon's high internal resistance had been found to be beneficial in suppressing both RFI (Radio Frequency Interference) and EMI (Electromagnetic Interference). The first of Van den Hul's interconnects (named, simply enough, "The First") was well-reviewed in a number of publications and was followed by other interconnects, phono cables, and speaker cables over the years, winning international recognition in the process. Van den Hul's first award for this technology was the Milieu Award from Audio & Video Totaal, Magazine (Netherlands) in 1996, and this has been followed by numerous other awards, all the way to the present. A. J. Van den Hul, the designer, was, himself, granted the SAVA "Life Achievement Award" (AV Magazin.de & HiFi.nl) for 2007/2008. Another remarkable achievement, similarly well-received by audio enthusiasts and reviewers all over the world, is Norwegian designer Knut Skogrand's use of balsa wood as an element of the dielectric in his "Skogrand" brand cables. More familiar to most people as the lightweight material from which the airframe and supporting structure of model airplanes is made, balsa wood traps a high percentage of air within the cellulose of its cell walls to become a remarkably similar natural equivalent to the "honeycomb" material from which many modern real aircraft are constructed, and gains from that trapped air a dielectric constant far lower than even that of Teflon®, the Dupont® plastic material favored until recently by a majority of the manufacturers of the world's most technologically-advanced audio cables. 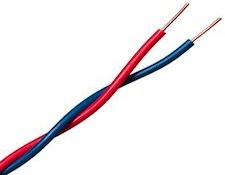 The dielectric of a cable is the material or composite of materials within a cable that surrounds and separates the cable's (and the connectors') conductors. Put most simply, it's the cable's or connector's insulation, and, because all cables have capacitance ― the ability to store signal energy for later release ― and because this stored energy is both stored in the dielectric and can directly affect both the electrical nature and sound quality of a cable, the dielectric constant - the relative ability of a given volume of dielectric material to store energy - is of great importance. For cable purposes, the lower the dielectric constant is, the better; and the "material" with the lowest possible dielectric constant is a "hard" vacuum, which has a dielectric constant of 1.0. After that, all other materials or composites are rated numerically by the ratio of their energy storage capability per cubic volume to that of a vacuum. Air (rated at sea-level) is the next lowest, with a dielectric constant of around 1.0006. With a dielectric constant of just 1.4, the balsa wood used by Knut Skogrand can be seen to be remarkably low, especially as compared to such other popular cable dielectrics as Dupont® Teflon® (1.95 for the very best variety, up to about 2.05 for some others), Polyethylene, at around 2.2 -2.4), PVC, by far the most common of all dielectric and insulating materials for cable use (3.5 to around 7.0, depending on what other materials are mixed in with it), and some of the TPRs (Thermoplastic Rubbers), that can range as high as 14.0 - a full TEN TIMES as much as balsa wood. The one serious drawback to using balsa wood in a cable instead of some more conventional dielectric material is the fact that - being WOOD, it is essentially rigid, and unable to be bent at all. Needless to say, that could have been an insurmountable obstacle, but Skogrand quite cleverly gets around it by using many very short lengths (beads?) of balsa wood arrayed along the length of each cable to provide the desired dielectric advantages without seriously restricting flexibility. The use of these "beads" also contributes to the Skogrand cables' genuinely unique appearance, which many people find appealing and which boldly declares their one-at-a-time "by hand" manufacture. Non-metallic conductors and non-plastic balsa wood dielectrics go a long way toward proving to cable Trolls that there's a lot more to cable design than just "wires is wires" and "L-C-R". So does Knut Skogrand's sometimes use of silk brocades rather than more conventional materials for his cables' outer jacketing. Even with all of this quite obvious innovation - including the use of organic cotton by other manufacturers as both a dielectric and a jacketing material - there still remain a number of unresolved cable issues that could (although it has not yet been conclusively proven) affect cable performance and sound quality. I'll write about one of them and suggest a truly innovative solution in Part 2.